About Kumar D. Message Kumar D.
Very professional tour with a lot of information provided by Kumar. We had a very nice and enjoyable weekend in Kathmandu. Will certainly come to Kathmandu again. TOUR GUIDE RESPONSE: Dear Bjoern Thank you for sharing your wonderful review, I am very happy to know that you have thoroughly enjoyed your tour. I look forward to the opportunity to welcome you back again Nepal. TOUR GUIDE RESPONSE: Thank you for your honest review upon our tour. It is nice to know that you enjoyed most part of the tour. I am also happy that you mentioned something that you didn't like about the tour. I tried to be as friendly and descriptive as possible in cultural tours as many of my clients are interested to know more about these things however I totally understand I might be giving too much when it might not be required for some. You might have faced the communication issue as English is not my mothertounge. TOUR GUIDE RESPONSE: Dear Wendy, Thank you so much for your wonderful review. It was an honor for me serving you guys. I too had an amazing time being at your service. Hope your kind words will bring more fortune to me in future days. Also hope to see you again. Thank you so much. Sincerely, Kumar D.
Kumar was the absolute BEST guide for a trip like this. Organized, very knowledgeable of the trail, what to expect, the amenities, knew all the lodge owners personally and was able to flawlessly rearrange some last minute changes to our itinerary that we requested. This was a once in a lifetime experience and Kumar made it fun, safe, comfortable and educational. His love for Nepal was an inspiration to us. His porters were outstanding, especially Raj, who we grew to love and admire. TOUR GUIDE RESPONSE: Thank you for such a kind word, you both are nice people, I am hoping to seeing you again. Kumar D.
Kumar is a an extremely professional and knowledgeable guide. He is well trained in the history of Nepal, Buddhism, and Hinduism. His tours are well planned and perfectly timed. He contracts with conscientious drivers (important in Nepal). His English is excellent. One of the most delightful parts of the tour was his desire to show us real life in Nepal. He took us to several small villages, and this was the highlight of our visit! His love/pride for his home country makes him an outstanding guide! TOUR GUIDE RESPONSE: Dear Melissa, Thank you for your outstanding review, I believe that I am trying best as I can, thank you once again for your excellent review. This was a true cultural experience that surpassed all my expectations. I arrived late with my flight and my guide picked me up from the airport instead of my hotel where we then went for the dinner and show. The dining experience then set the stage for the rest of my trip because I knew what the traditional foods were and how they should taste. A really great experience that is a highly recommended "must do" in Nepal. TOUR GUIDE RESPONSE: Dear Michelle, Thank you for your wonderful review, I am happy about your kind words. Hope to see you again. Kumar D.
Solo travelling made easy. Thanks to by guide and driver, a wonderfully comprehensive trip of Nepal. Memorable from first to last. Kumar organized my dream tour outstandingly, welcomed me at airport and for a week served as my personal guide in Kathmandu, Chitwan, Pokhara, with superior English skills. He's extremely knowledgeable about Nepal's culture and goes out of his way to help with lodging, attractions, transportation, food, shopping. He managed daily activities, schedules very effectively. I thank Kumar and recommend him wholeheartedly as Nepal's best guide. He's an excellent host who focuses on your needs and enjoyment. Kumar was not available to give the tour due to family illness. The substitute attempted to charge me entrance fees for the large number of attractions we were to visit, fortunately I had brought my confirm with me indicating they were included in the price. The substitue guide tried very hard, and was enthusiastic, but we had a moderate amount of difficulty understanding his English. The driver was excellent, and very careful - both did the best job they could given the circumstances. TOUR GUIDE RESPONSE: Thanks for your review, I am sorry, there was miss understand for the entrance free, I hope you forgive me. Highly recommend Kumar - he is very friendly, knowledgeable and helpful! Kumar customizes the tour to your needs - if you like taking photos, if you want to spend time at a certain place, whatever you want - he is very accommodating and puts you as the focus. Great guy, had an awesome time. Thanks! Very much enjoyed my travel with Kumar. His local knowledge was great. He let me choose the times and there was never any rush. He let me do the things I wanted at the pace I wanted. My couple of days trekking were probably the best part of my trip. Kumar clearly enjoys himself on these. Thanks to his enthusiasm, I reach 4,000m, my personal challenge. I'd highly recommend him to anyone, especially to those looking to trek. Kumar was a very informative, well mannered and well organised guide. He taught me a lot about the culture, history and the religions of Nepal and also about the daily life and the food. Kumar has made every effort to make sure i had an enjoyable and meaningful trip. Kumar's help and advice were invaluable to me. Had a great tour around nepal with the tour guide Kumar .. he is friendly, always available and pretty knowledgeable.. a plus to recommend! TOUR GUIDE RESPONSE: Thank you Ivan, I'm glad you enjoyed the tour. See you again in Nepal! kumar. TOUR GUIDE RESPONSE: Hi Fred L & friends, thank you! 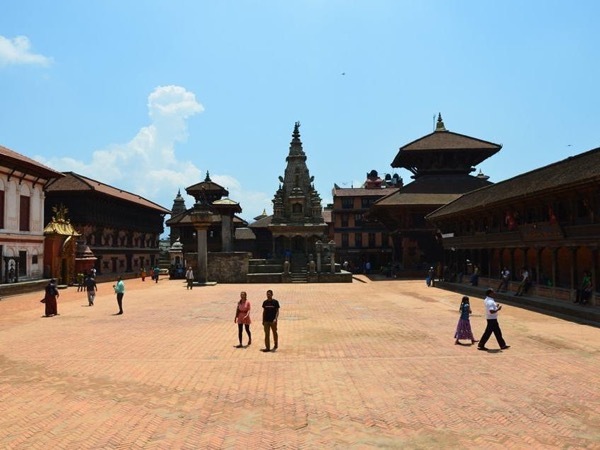 It was a short trip in Bhaktapur, but glad you did enjoy it. Hope to see you all again in the near future. Although we had to cut short our tour of Nepal by one day because of the political situation and recurrent strikes, we enjoyed ourselves immensely and learned much about Nepal's culture, history, and customs. Kumar is very easy to talk to and responds with honesty and deep beliefs that shows his knowledge and love for his country. We will not hesitate to ask Kumar to again be our guide to Nepal. TOUR GUIDE RESPONSE: My guests were always kind to bless me with such words, which is actually more encouraging; I am excited to read good words about my services, Thanks for your support and review. I will look forward to meet you on your next visit to Nepal, be happy.